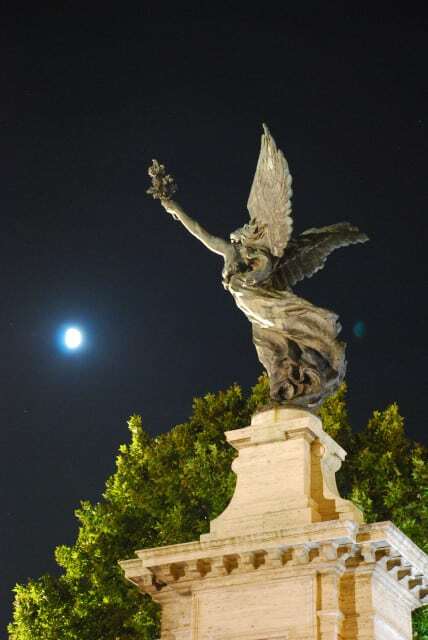 What are the best sights to visit at night in Rome? 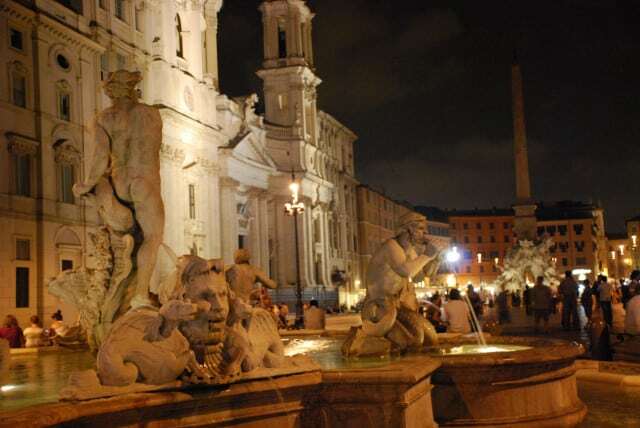 Discover the magic of Piazza Navona, St. Peter and the Pantheon in the dark. 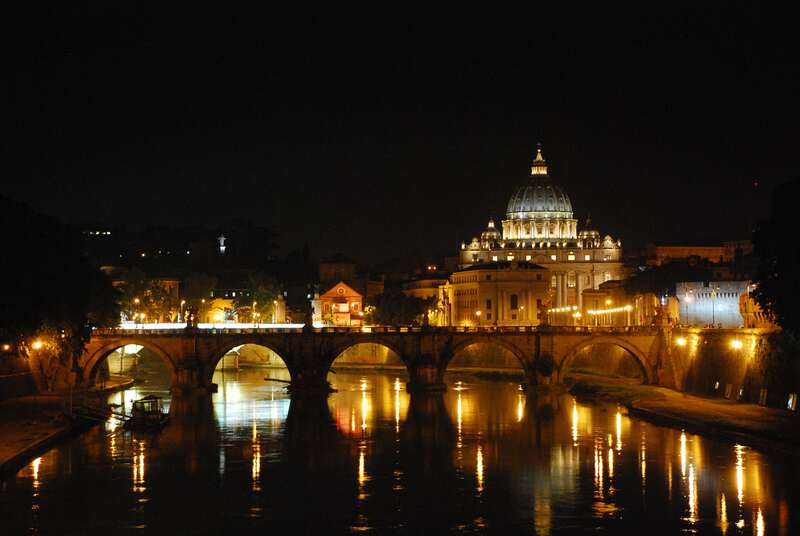 A two hours night walk in Rome itinerary to discover Rome under a completely different light! 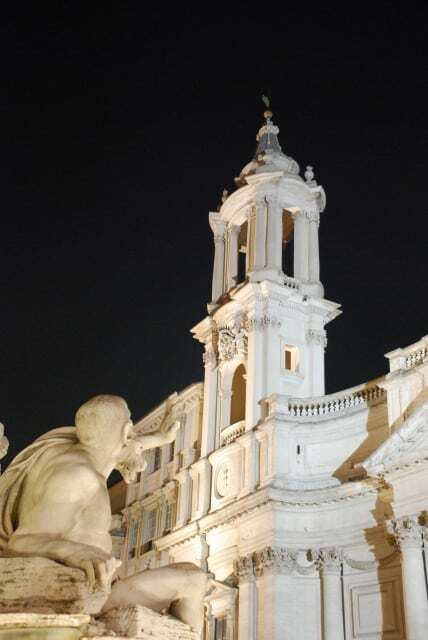 In this post, I’d like to share with you one of my favorite night walking itineraries in Rome. Not that much “off the beaten path”, but so delightful! Walking in Rome at night is just magical. 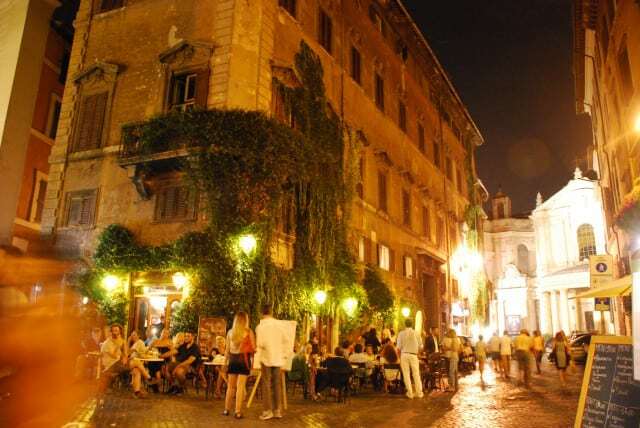 In the yellowish street lights of the old Roman neighborhoods, you can hardly miss the feeling of over twenty centuries of history, art and beauty. And, all around you, the Roman Dolce Vita, with its restaurants, streets artists, ice cream shops, and hundreds of Romans and tourists enjoying the nice weather and the fabulous surroundings! You can click on the map below to get to google map, the itinerary is easy and won’t take more than a couple of hours (excluding your Gelato stops!). And to bring your Roman night experience to the next level, what about an exclusive night visit to the Colosseum? Click here to know more! 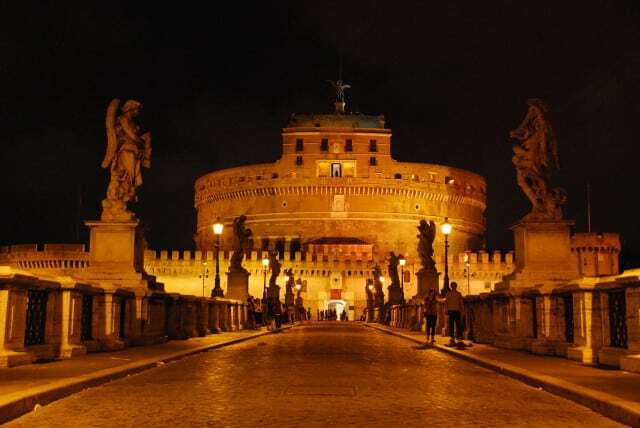 Our night tour starts from Castel San’Angelo, one of the town’s most famous landmarks. Castel Sant’Angelo appearance today is the result of a long series of transformations. Unfortunately, they have left nearly no traces of the “Hadrianeum”, the mausoleum that Emperor Hadrian built for himself in the second century AD. 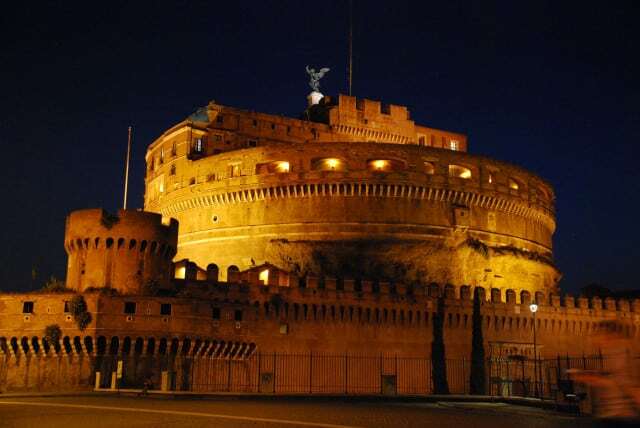 Used as a defensive bastion against barbarians during Emperor Aurelian reign, by the Middle Ages Castel Sant’Angelo had been transformed into a practically unassailable fortress, hosting an infamous prison. The popes converted the structure into a castle and also commissioned the construction of a covered fortified corridor connected to the Vatican Palaces (il “passetto”). It was to be used in the event of danger as an extreme escape route. This secret corridor inspired many dark novels, including Dan Browns’ “Angels and Demons”. In front of Castel Sant’angelo you will notice a beautiful pedestrian bridge, usually very crowded: Ponte Sant’Angelo. Ponte Sant’Angelo, formerly called “Bridge of Hadrien”, was built in 134 AD and is one of the oldest bridges in Rome. During the Middle Ages, pilgrims used it to reach St Peter’s basilica. 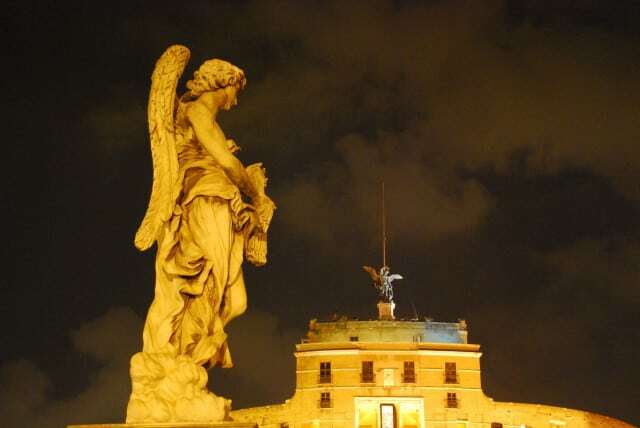 In the seventh century both the castle and the bridge took on the name Sant’Angelo, due to a legend holding that the Archangel Michael appeared atop the mausoleum, sheathing his sword as a sign of the end of the terrible year 590 plague. 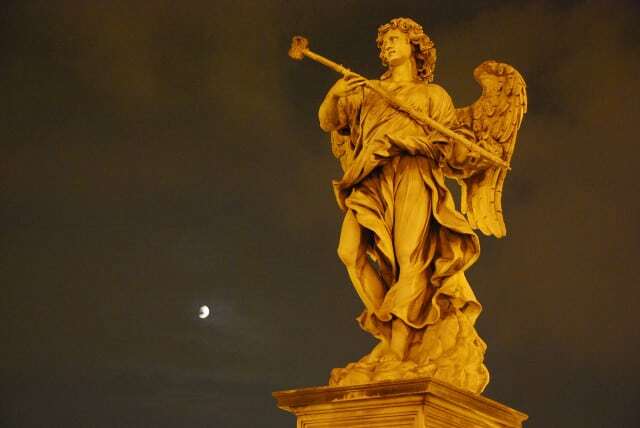 In 1669, under pope Clement IX, Bernini adorned the bridge with ten angels holding instruments of the passion. He personally only finished the two originals of the Angels, but these were kept by Clement IX for his own pleasure. They are now in the church of Sant’Andrea delle fratte. 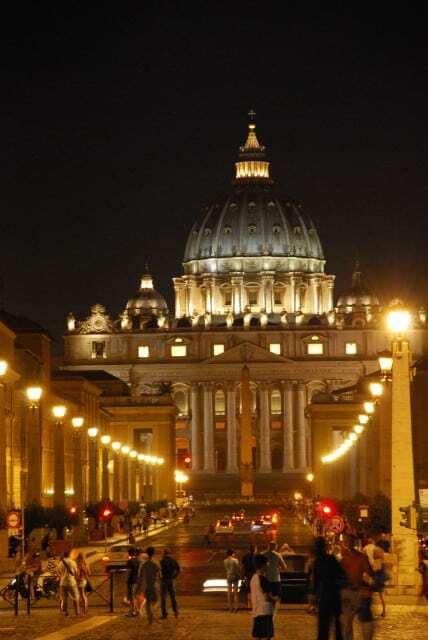 Walking left, you will admire majestic via della Conciliazione, leading to St Peter basilica. This avenue is actually the result of one of Benito Mussolini “modernizing” demolition initiatives, aiming at providing Rome with monumental perspectives. 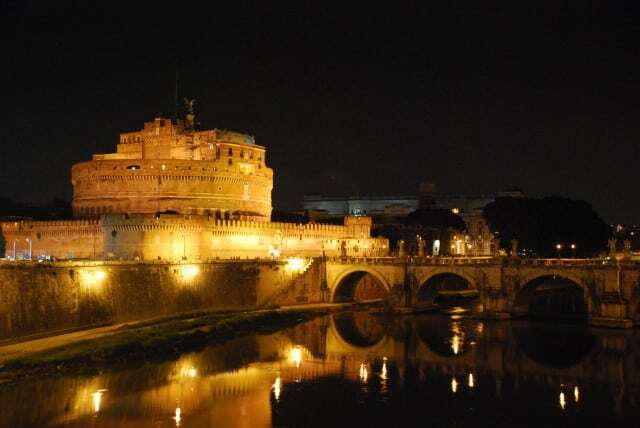 Now cross Ponte Vittorio, to admire on of the most scenic views of Castel Sant’Angelo. A few meters ahead, take Via del Panico to enter the Rioni (districts) Ponte and Parione, among the most delightful and fascinating roman neighborhoods. You could wander for hours in the middle age narrow streets, discovering romantic corners and picturesque sights. Don’t rush, take your time to explore the area and to enjoy the unique atmosphere. This is one of the places where the liveliness of Roman life is most tangible. So just sit in one of the many cafes and enjoy some true “dolce vita” moments. 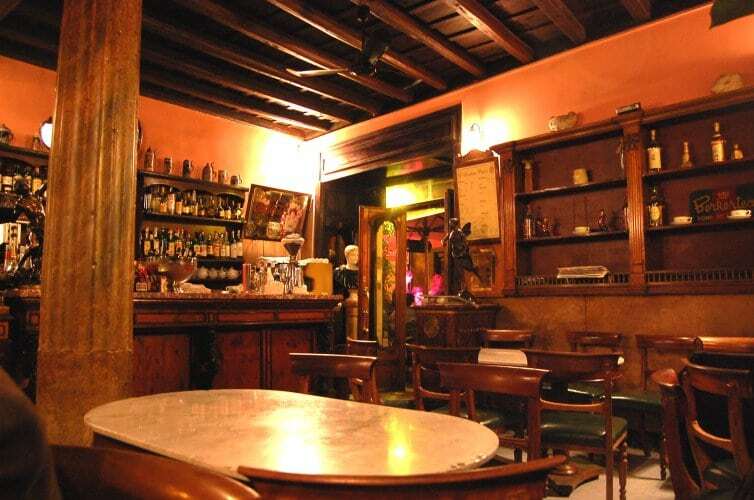 If you are lucky enough to find a place to sit, try the famous “Caffé della Pace“, in via della Pace 3/7 or the also famous Bar del Fico, piazza del Fico, 26-28. 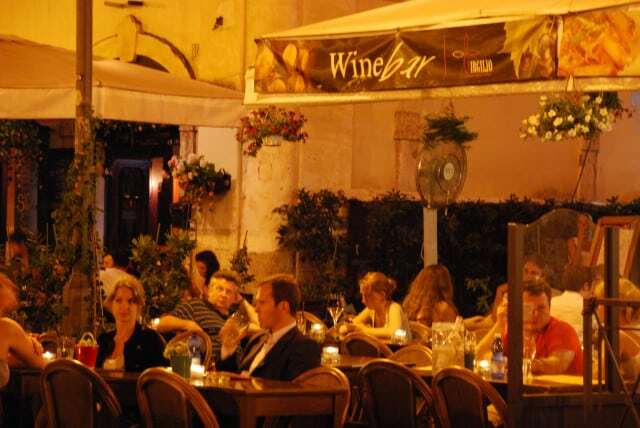 You will actually found dozens of nice bars and restaurants in the area, but these two are my favorites places to have a drink end to enjoy the Roman night. After sipping your cocktail, keep walking in via del teatro Pace, turn left in via del Governo Vecchio. 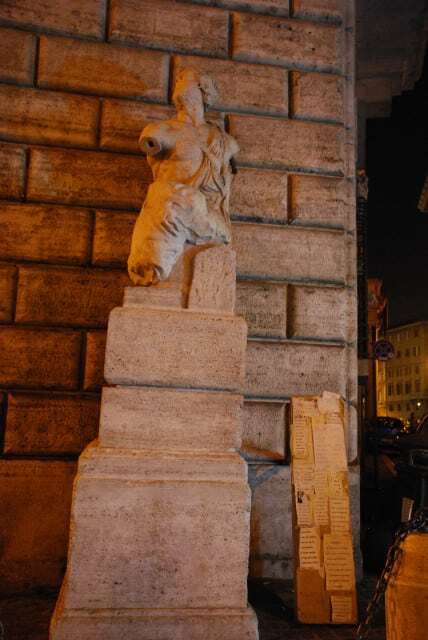 There you are, in front of you a true Roman legend: the Pasquino statue. The statue is what remains of a work from the 3rd century B.C. that once decorated the Stadium of Domitian. It was found during paving works of the area and in 1501 the cardinal Oliviero Carafa located it in the ancient Piazza di Parione. 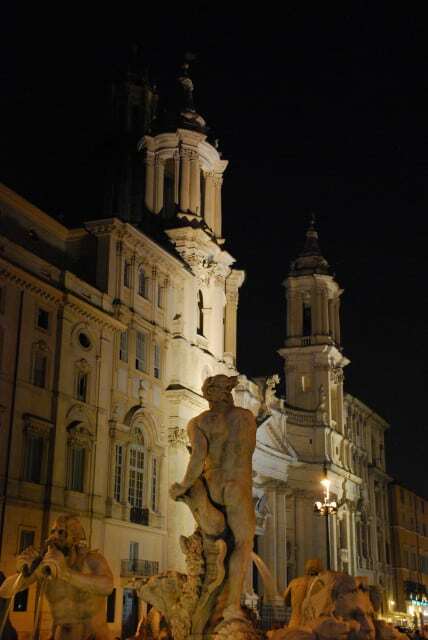 It was named after Pasquino when the statue grew in popularity. 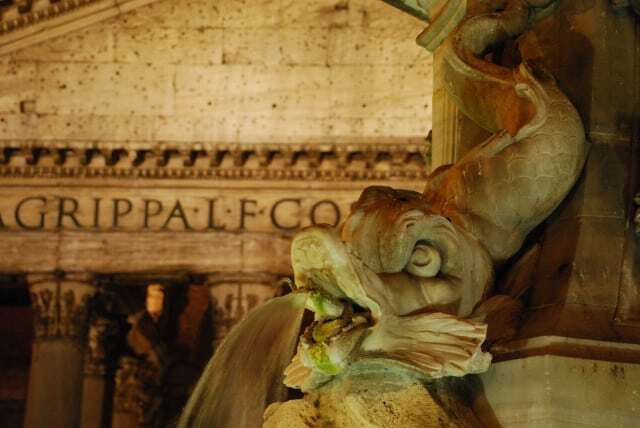 The origin of the name, “Pasquino” remains obscure. 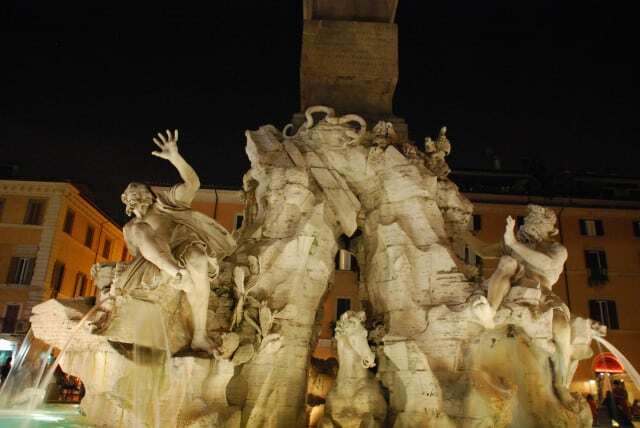 However, from the 16th to the 19th century, Pasquino became the first “talking statue” of Rome. 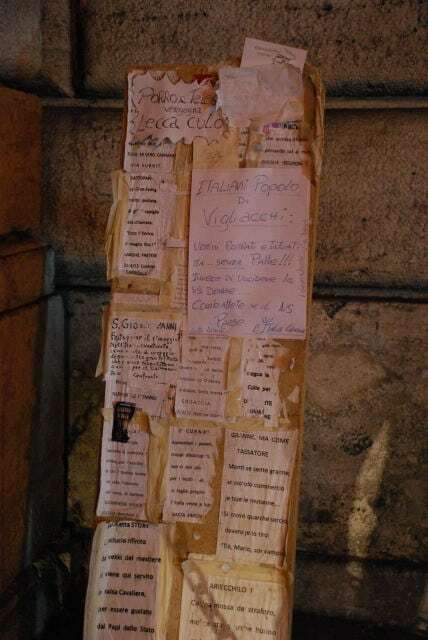 Satirical verses attacking the most well-known public figures were hung around its neck, speaking about the people’s dissatisfaction, denouncing injustice and misgovernment by members of the Church. These stinging insults came to be called “Pasquinate,” taking the name of the statue that best demonstrated the people’s discontent about corruption and abuses of power. Today, the base of the statue is still used to stick up boards where the common people express in rhyme or in prose its discontent. 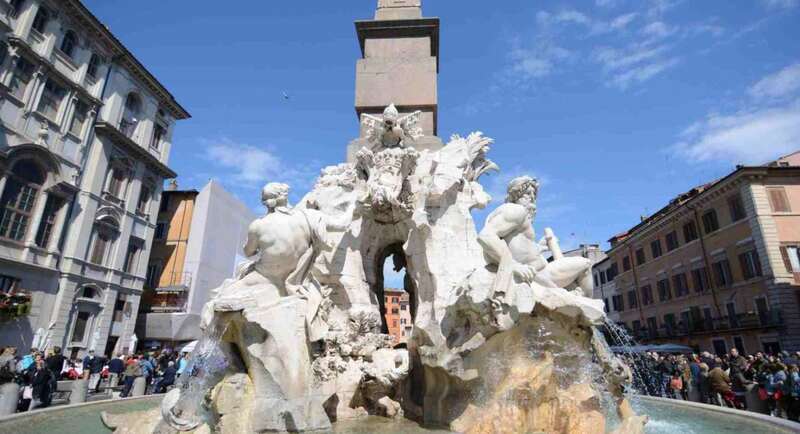 A few steps away, you’ll discover the magic of Piazza Navona. 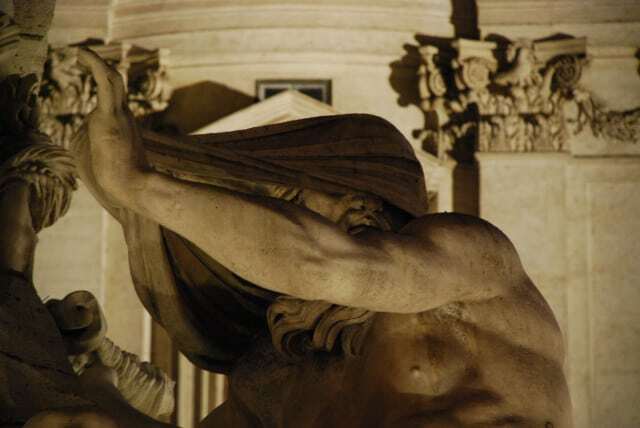 Built on the site of the Stadium of Domitian, Piazza Navona is one of the finest baroque masterpiece in papal Rome, which displays the genius of artists such as Bernini and Borromini. And, at night, it is simply magic. 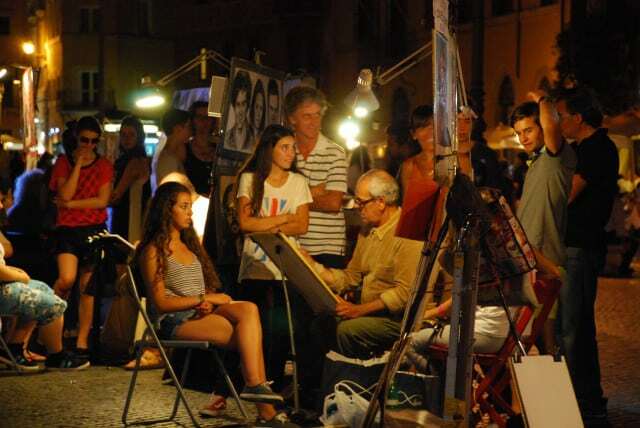 In the summer time, the piazza provides a continuous festival of painters, caricaturists, fortune-teller and buskers, who entertain visitors until the small hours. At that point, you will be really hungry. Many restaurants in this area are tourist traps, catering little more than Spaghetti Bolognese and Pizza, but some exceptions can still be found. 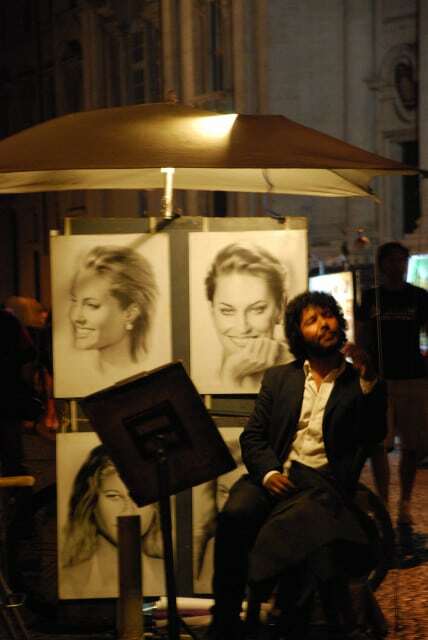 One of my favorite places is the Ditirambo, close to Campo de’ Fiori square. 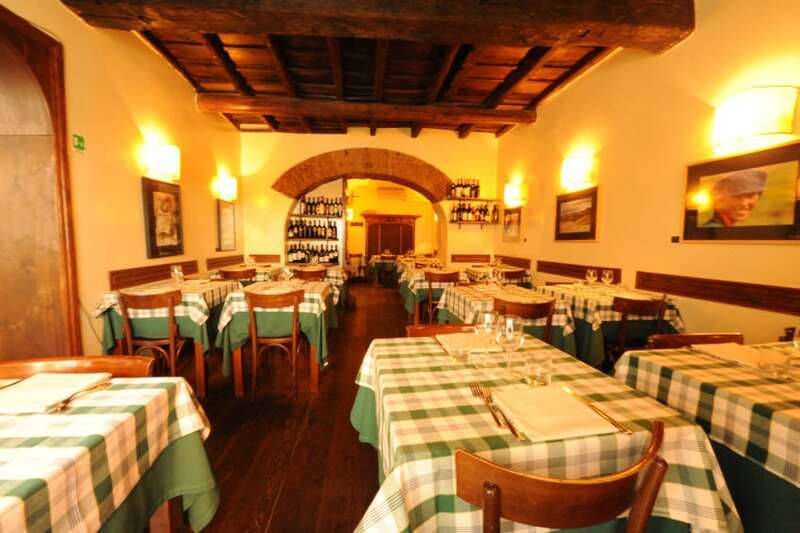 Here you will have the opportunity to taste some “modern” italian cuisine, in a traditional decor. Good value for money, in my opinion. 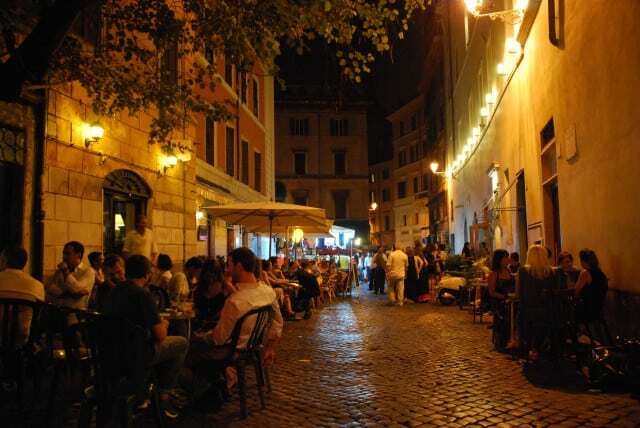 The Campo de’ Fiori square is another major Roman night life landmark , with many cafes to sip a glass of whine or a cocktail while enjoying the street life. 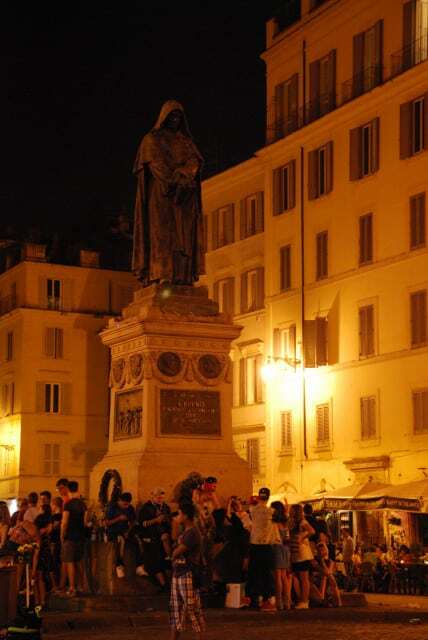 In the center of the “piazza”, note the statue of Giordano Bruno, a famous Italian Dominican friar, philosopher, mathematician, astrologer and astronomer. Sadly enough, the Roman Inquisition found him guilty of heresy and burned at the stake. 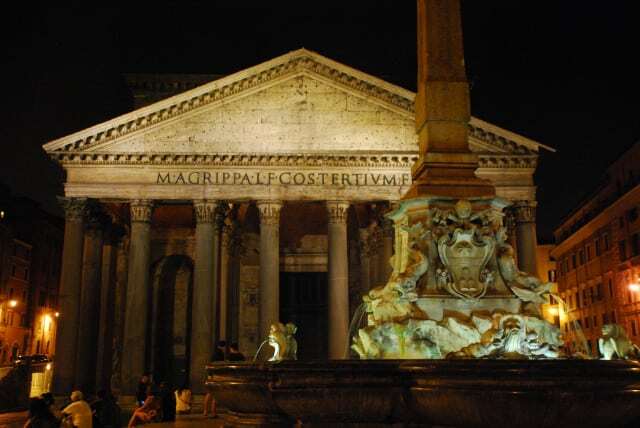 If you still have some energy, you can head to one of the best preserved ancient Roman monuments: the Pantheon. To end your walking tour in a glorious way, keep walking back towards the Tiber river, until Ponte Umberto 1°, to admire the best view of St Peter’s basilica. 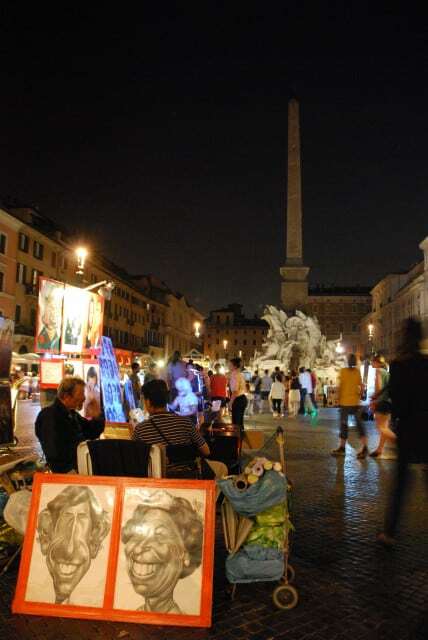 Enjoy your night walk in Rome! Hey!! let’s say if we were to cover this route in one night. how long do you think it will take? Is it easy to walk to over all these places? Hi Valerie! Yes, you can do all these places in one night! Actually it’s what I did when I shot the pictures displayed in the post, roughly from sunset to midnight. oh dear, i loved your article! u saved me loads of money. i was searching since long for something like this. now i will make my second trip to Rome in December so much better. Can’t wait to give this a try the end of April! Thanks! This was brilliant! Thank you!!! Any idea the total distance? Can’t wait to try this our first night in Rome in August. Thanks!